Take your music anywhere and sing along with your favorite artist with this Pure Acoustics portable karaoke system. Complete with 2x Mic inputs, auxiliary input, a USB port and SD Card slot, the MCP-30 will deliver exceptional sound quality from any device. With amazing looks and design, the Pure Acoustics MCP-30 makes listening and singing along to the music easy and enjoyable. Featuring a powerful digital amplifier and three active speaker drivers, the Portable Karaoke System delivers controlled powerful and clear mid-range and treble - resulting in an outstanding sound quality, ideal for singing along too. With music not being solely confined to MP3 players and smartphones, it is important for your sound system to be able to adapt and play music from any source. That's why the Pure Acoustics MCP-30 has a built-in USB port and SD Card Slot, so that no matter where your music is stored, this spectacular Karaoke system is always ready to get the party started. Bluetooth enabled so you can pair it to all your devices; Also the incorporated FM Radio will provide endless entertainment. 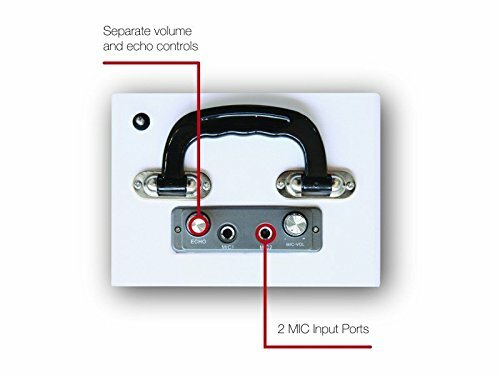 The MCP-30 was designed to allow you to enjoy all the qualities of a professional speaker with all the benefits of a portable music box.The 2 Microphone input ports allows you to connect 2 microphones simultaneously with independent volume & echo controls while the rechargeable battery offers over 4 hours of continuous play time. The Pure Acoustics MCP-30 Portable Karaoke system is Bluetooth enabled, the pairing process is incredibly simple and allow you to connect to your device wirelessly. It supports any Bluetooth music device and you only have to turn the speaker on and search for it using your device to begin listening and singing along with your favorite tracks. 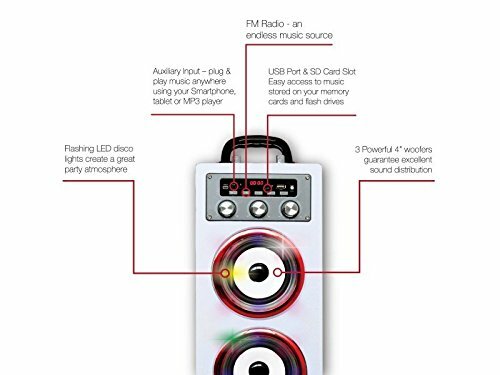 Using the Auxiliary Input you can plug & play music anywhere, using any Smartphone, Tablet, or MP3 Player, including iPhone, iPad and iPod . The Flashing LED disco lights create a great party atmosphere anywhere. These Multimedia Karaoke Machines are brand new, 2 years warranty.